Old themes are being played in new variations as designers recycle and refresh time-tested choices. 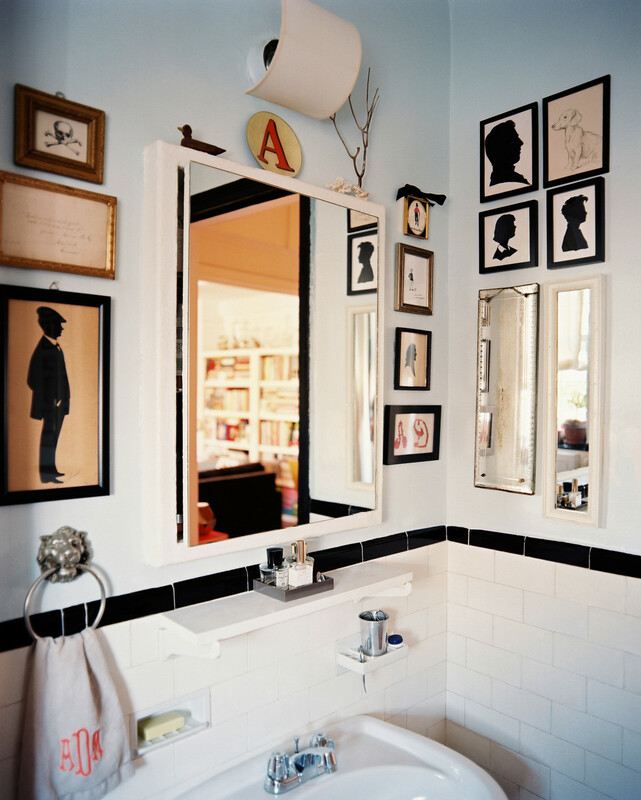 The result can make you look again at the humble subway tile, for example, or that old-fashioned framed silhouette you never quite knew what to do with. 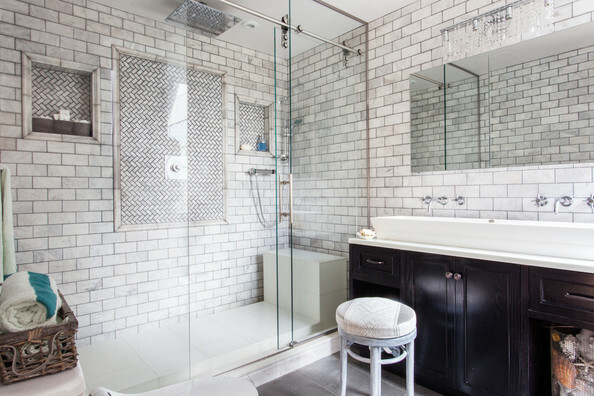 Get ready to see your bathroom in a different light. This trend not only ups the elegance quotient for small spaces, but can also visually enlarge them. Here, designer Ruthie Sommers does the walls of this Manhattan apartment in faux-croc vinyl and the floor in wall-to-wall sisal carpeting. And the carefully chosen lamp, sconces, and ceiling fixture amply—and stylishly—keep things bright. Floor-to-ceiling white subway tile is a bold (bordering on stark) choice, but adding variations of texture and pattern lends visual interest. In this Manhattan master bath by Wellbuilt and Tiger Lily's Greenwich, the herringbone pattern of the long wall’s central mosaic and flanking recessed niches creates depth and a refreshing contrast. 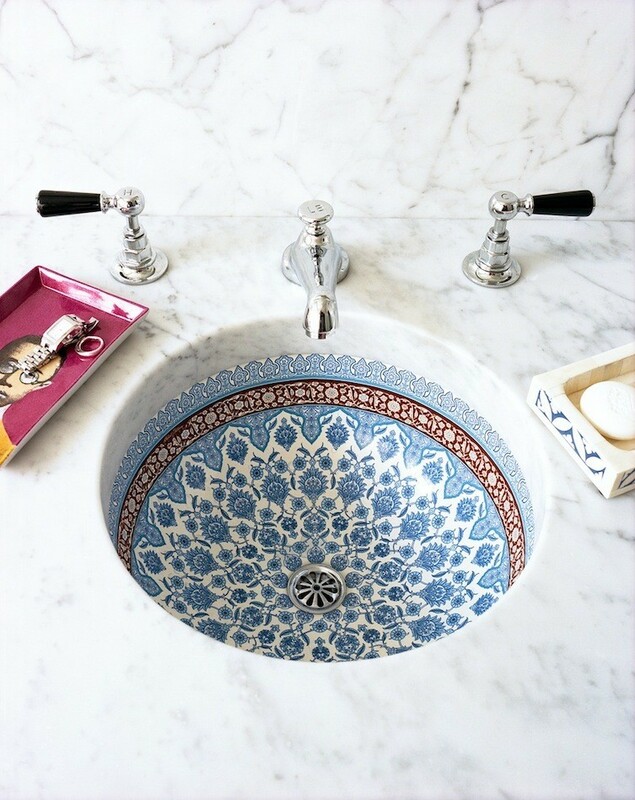 We're wild about many of the intricately patterned new alternatives to the plain-vanilla porcelain basin. Check out the array of options—some handmade—at Linkasink. 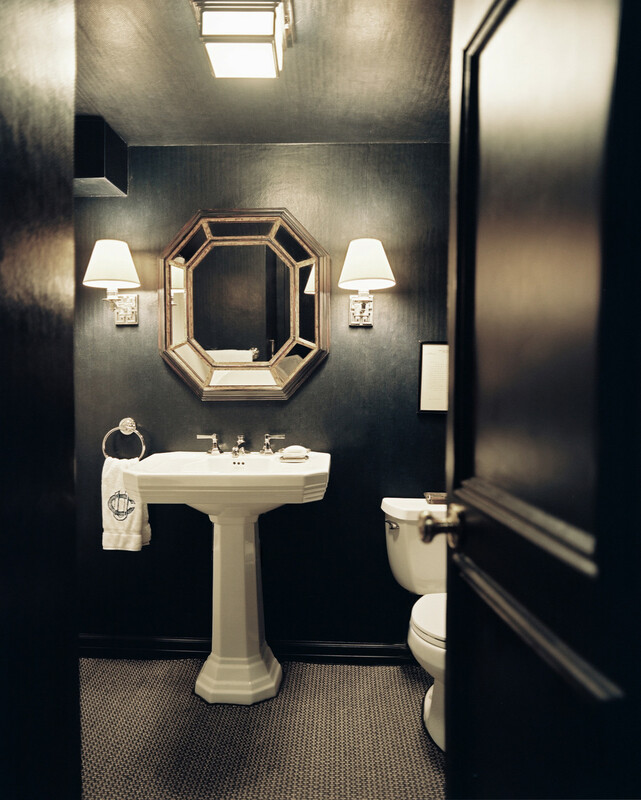 And for inspiration, see the photo below of a sink in the Hudson Valley boutique hotel Glenmere Mansion. 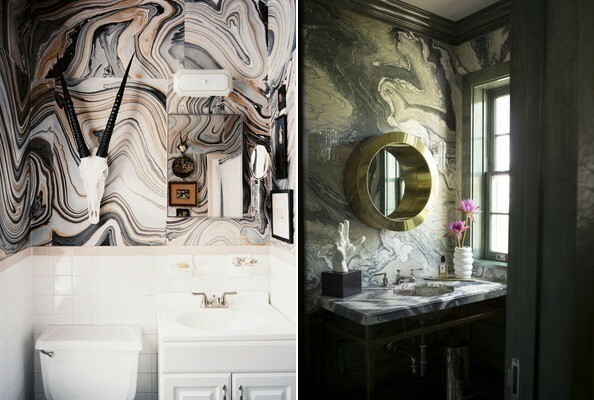 Whether faux or real, marble is on the march in both kitchen and bath. Nicki Clendening's tiny urban bathroom (below left) is visually expanded and enriched by the addition of vivid paper on ceiling and wall. And the genuine article (below right) is highlighted in designer Kelly Wearstler’s Beverly Hills powder room; paired with a porthole mirror, the green marble walls take the design to the next level. Artworks are making their presence felt big-time as bathrooms become a showcase for individual aesthetics. Below, in designer Angel Dormer's space, the collection of cameos and silhouettes forms a clever counterpoint to the reflection in the mirror.